I got a really good deal on ground beef at the store the other day, but it had to be used up within a day. How to use up 5 pounds of ground beef? Well, I made beef stroganoff with a pound of it for lunch. And then I decided to be brave and as Paul to use the pressure canner again. So I fixed a big pot of chili. I didn't take notes so I don't technically have a recipe, but I browned the beef with 5 cloves of garlic and drained it (I would've added onions but I was out). Then I added one of those huge cans of tomato juice, two chopped green peppers, a bag of dry black beans, a bag of dry kidney beans, 1/2 can of chipotle pepper sauce, 1/2 cup chili powder, a couple tsp. cumin, 1 tbsp. salt, and about 5 cans of diced tomatoes. I simmered this concoction for 20 minutes to let the flavors mix (the beans cook during the pressure canning, so no worries about that). I got 13 pint jars filled up and Paul took them outside to supervise. He doesn't seem to worry about blowing up the house as much as I do. The jars were processed for 75 minutes, which is the guideline for ground beef. I did pint jars because I thought they'd be handy to do things like chili to top baked potatoes or hot dogs. For larger meals, we could do a couple of pints at a time (and to stretch them, add in elbow mac and a can of corn if needed). The next day, I made Cincinnati chili (chili over spaghetti noodles and topped with cheddar cheese). The chili turned out so good! It was a hit and Cort already asked when we would have it for dinner again. And the best part? It only took ten minutes to toss together this home cooked meal, as the chili was already made. See...canning is addicting, isn't it! It is such a good way to preserve those foods we find on sale. Today I canned 13 pints of boneless chuck roast that was on sale at my grocery. I'd be inclined to use that pressure cooker/cold fusion reactor outside. You could call it "Lisa's Nuclear Chili"! I wish my stomach could handle chili...I have always loved frito pie, but never get to eat it anymore. Your industriousness makes me feel lazy thins morning...I think I will clean a closet out or something. LOL! Sans recipe is the best way to make chili!!!! My daughter made the beans in a presure cooker but her recipe only said 10 minutes. not good, think i will pass on the 70 minutes. I love seeing your pint jars lined up together. You are smart to use the dry beans. It's so nice to have something ready to eat on busy days. Good for you! je hebt heel mooi werk verricht. That chili looks very tasty. 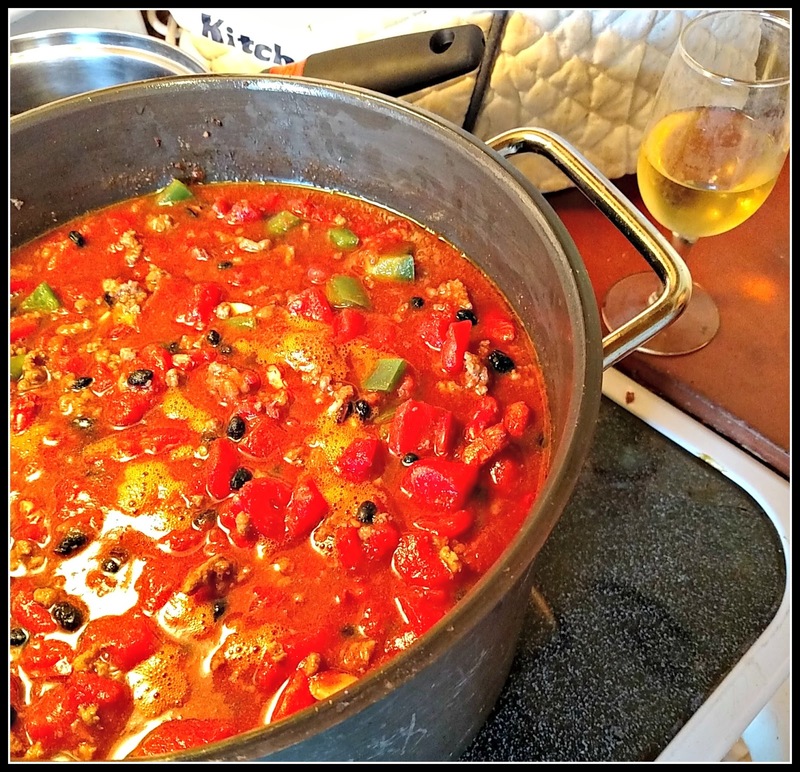 We have been making soups a good bit lately in the crock pot, but maybe it's time for some chili. Crock pot works well for that too. We buy ground beef when it's on sale, and put it in the freezer. If the power goes, I can keep the freezer cold with the generator long enough for us to eat the food inside. 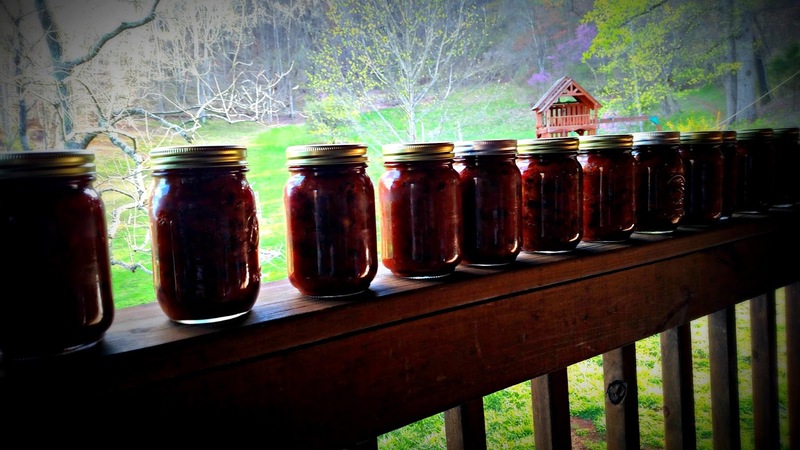 Canning is a much surer way to preserve the food. I tried to learn how to do it once but never really got off the ground. That turned out good! I have not canned anything like that. I did make brunswick stew starter which was everything but the meat and we canned that so that we only had to add some chicken and cook for a while. I really ought to have a go at making chilli, so have 'borrowed' your recipe to use as a guideline! Very clever! I've tried cannining.. and it makes me so nervous, regarding if it's "safe" to eat later, even though I know as long as you follow directions, it's perfectly fine. Still!... so, I stopped doing it. Which is silly, really. Boy, that chili looks delicious! My mom canned every year when I was growing up but I'm too chicken to do it. The chili with spaghetti noodles sounds like a Larry dish--I will have to tell him about it. Oh it sounds soo good! DId you freeze all of that in the jars? Way to go! It all sounds very delicious. It sounds like you have another 13 quick and delicious meals ready to go. I am so impressed by you. What a coincidence. I made chili last week. When it was rather warm, too. Silly me. Good for you! I tried canning many years ago. The results were not worth eating so I never tried it again.